Far away from the city's chaos (well, 14 km from Mukteshwar, to be precise), lies a sleepy Himalayan village called Sonapani in Satoli. It's a private estate of 12 mud cottages surrounded by organic fruit orchards and farms. For the lazy vacationer who just wants to kick back and cut off from the city, Sonapani is a dream come true. Devoid of anything that'll remind you of the city (WiFi, pollution and concrete roads included), Sonapani is the kind of place you'd want to spend your time at when you're sick of the corporate rigmarole. 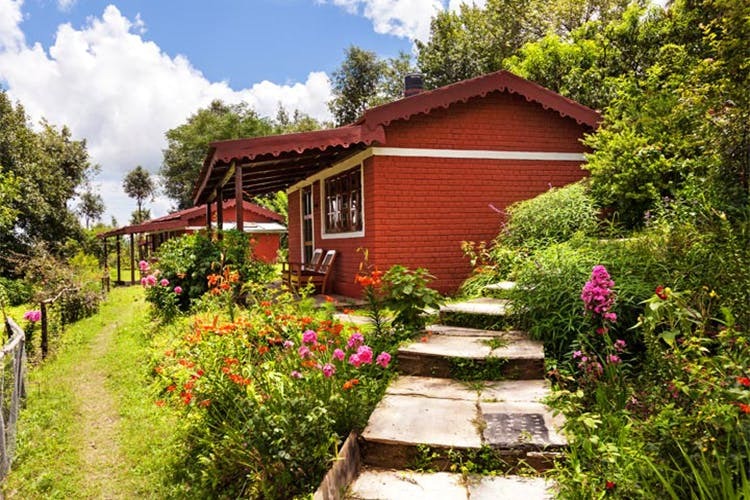 In this cosy village, each one-bedroom cottage comes with a private sit-out, solar water heaters, a dressing area and stellar views of the Nanda Devi. Catch up on your sleep or on the novel you left midway, and for when you're ready for ghost stories and music around bonfires, head to the village's community area. This area also has a common dinning hall where all the fresh, home-cooked meals are laid out buffet-style. All the veggies used are from their organic farm and even their preserves are made of fruits from the backyard orchards. We also hear great things about Sonapani's baked breads, cakes and home-style Kumaouni meals. Coming to all the things you can do around here, there's plenty of villages, jungles and even a stream you can wander off to. Trekking to the 10th century Kapileshwar Temple, the Mona Village and picnics there are some other the options. Plus, plenty of photo-ops and zero crowds, pack your bags already! Picture this: Getting up when you want to a view of the Himalayas, stuffing your face with freshly baked cakes (also, whenever you want) and sitting around community bonfires sipping malt; this and much more is possible at Sonapani. If this is not the good life, what is? Tariffs: Starting at INR 6,991/night (inclusive of all meals, snacks and GST). Check out their website here and follow them on Facebook for more updates.